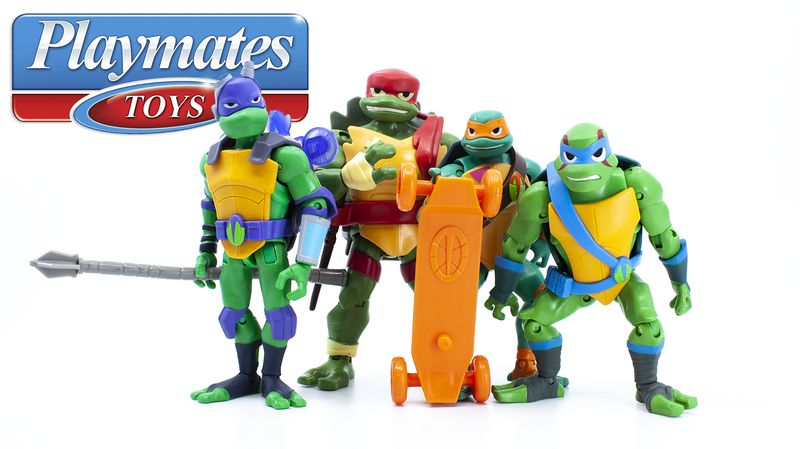 Posted by Jon in Playmates, Review, TMNT with 0 comments. The Teenage Mutant Ninja Turtles franchise is in the beginnings of a fresh reboot titled ‘Rise of the Teenage Mutant Ninja Turtles.’ Now sometimes the term reboot can give a negative connotation, but that is the furthest thing from the truth here. Evergreen (get it?) properties like TMNT periodically go through reboots to keep the brand fresh and exciting. Design-wise, this new series is a pretty big departure from the previous run. At least as far as the four turtles are concerned. An interesting concept that has been brought into play with ‘Rise of the TMNT,’ is that all of the brothers are different species of turtles. Which of course means that everyone gets a unique sculpt! Michelangelo is a Box Turtle, Leonardo is a Red-Eared Slider, Raphael is a Snapping Turtle, and Donatello is a Soft-Shell Turtle. Raphael is the largest of the four, and he also takes the role of leader in this new series. Now when I say Raphael is the largest of the four, I mean it. He’s a nice chunk of plastic, towering over the other three. He really fits the description of a bruiser, and that’s why he’s easily my favorite of the bunch. His energy effects are great too! For sub $10 action figures, Playmates really packed these guys with articulation. All four turtles have hinge-swivels on their ankles, knees, hips, shoulders, and elbows. Along with that they also have swiveled wrists and their heads sit on a ball-joint. The previous TMNT action figure line was really good about keeping the price low and the value high. As a person who will likely end up picking some of these up for my kids, I appreciate Playmates continuing this trend. As far as accessories go, each figure comes loaded to the gills. Wait, turtles don’t have gills? Anyways, they all come with normal weapons specific to their character. In addition to that, every turtle has an “energized” clear weapon which appears to be meant to show them in action. For example, as you can see above Donatello’s staff has a twirling motion effect. I understand that the designs for this new show and subsequent toy line aren’t going to be everybody’s cup of tea. However, I think they work quite well as action figures. You can get some real nice attitude out of these sculpts. The unique look of each turtle also brings some variety to the toy aisle shelves. ‘Rise of the Teenage Mutant Ninja Turtles’ figures are currently available on retail shelves everywhere. However, if you don’t feel like leaving the house there are always options such as Amazon. On top of the basic action figures there are also vehicles, playsets, and even larger sized toys. I expect we’ll be seeing a lot more from this line in the near future! ** Figures for this review provided by Playmates.